Text reproduced from the Bath Chronicle, March 6th 2002. We lived in Cross Lane which ran down from opposite the Griffin in Monmouth Street to Kingsmead Street, almost opposite to Kingsmead School. Further down the lane lived a Mrs Kilminster who ran a small shop selling second-hand ceramics and lucky dips. (Her damaged house is pictured here. There are other pictures of Cross Lane here). Across from there lived a local hero, Jim Cope. In early 1942, most people took very little notice of the air raid sirens. The first I knew of the raid of April was being woken to hear exploding bombs. We went down into the small cellar and as more bombs whistled down, all the doors and windows blew in, and later on the top of the house went. The noise and concussion were considerable and I was astonished by the amount of debris falling down from the sky. 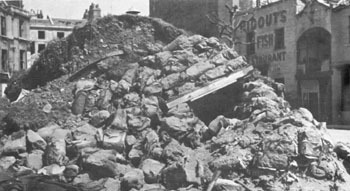 At the time, we had a canary and during a lull in the bombing, I came upstairs to find his cage blown off the wall and lying in the rubble with him standing on top of it as stunned as we were. I righted the cage and put him back inside. I always regretted not having the wits to take him down in the cellar with us. He lived on for several years. In Martin Wainwright's book The Bath Blitz, there is a photograph of Kingsmead Street showing the Red Lion public house on one corner of Cross Lane. On the other stood Alderwick's the butchers across the street was Kingsmead School which I had attended as a boy. Like many lads of the time, I amassed a considerable collection of shrapnel varying from one to 12 inches in length, together with the tail fins of several incendiary bombs. Later on I served in Germany and saw unbelievable bomb damage. Still, "as ye sow..."
Cross Lane was a pedestrians only road, a bit like Bridewell Lane is now. It no longer exists and Kingsmead Flats are now built in that area. Kenneth spells the pub name as The Griffin, and the sign outside that pub today has that spelling. In the 1940 Directory, this was known as The Griffen. It's postal address was 1 Princes Street. Martin Wainright's book is still available, either on loan from Bath Library, of for sale in the Oldfield Park Bookshop in Moorland Road. The picture Rocky refers to is in Lita's Story. The Red Lion is the building on the extreme left of the picture. 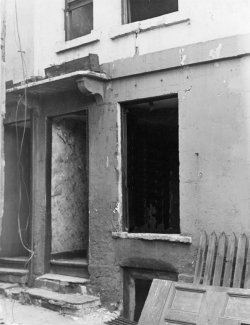 An incendiary bomb was mostly magnesium but with a steel tail fin (see picture right). The magnesium burned away, leaving just the steel fin behind. The full quotation (from the Bible) is "As ye sow, so shall ye reap". The modern expression "What goes around comes around" is similar.